November 1, 2017 (CHICAGO, IL) – Gold Eagle® Co. (“Gold Eagle”), makers of the leading line of protectants and cleaners, 303® Products, announced that its new 303® 4-in-1 Metal Polish received the award for Best New Product in the Appearance Chemicals & Car Care category at the AAPEX New Product Showcase 2017 Awards in Las Vegas. 303 4-in-1 Metal Polish is an easy to use, non-toxic polish that not only cleans and restores metals but also protects them. It removes rust and corrosion, brings shine back to make surfaces look brand new, and also leaves behind a protective layer to help prevent future scratches and blemishes. It is safe for use on ANY metal, including chrome, stainless steel, diamond plate, silver, gold, copper, brass, nickel, aluminum, magnesium and more. 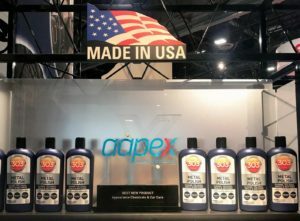 The AAPEX Best New Product Awards are based on five categories, including Accessories & General Merchandise, Appearance Chemicals & Car Care, Automotive Lighting, Chemicals, Lubricants & Filters, Hard Parts, Safety, Technology and Tools & Equipment. 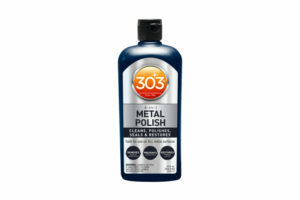 303 Metal Polish rose above the other entries and received the award in the Appearance Chemicals & Car Care category for providing exceptional chemical-based car protection and revitalization. AAPEX features more than 2,200 exhibiting companies and 50-plus AAPEXedu sessions. Approximately 158,000 automotive aftermarket professionals from more than 140 countries were in Las Vegas during AAPEX and the SEMA Show. To learn more about 303 Products, please visit www.303products.com. Founded in 1932, Gold Eagle® Co. is a family owned and operated company that is an industry pioneer in the production and distribution of performance chemicals and surface treatments. Gold Eagle is driven to produce innovative products that protect and preserve the things we love and its award winning line up of products, includes STA-BIL®, 303® Products, TriNova®. HEET® Gas-Line Antifreeze, Start Your Engines!® , NO LEAK® Treatments, ALUMASEAL®, 104+® Octane Boost, Start Your Engines!® and DieselPower!® Diesel Additives. For more information please visit www.goldeagle.com. All trademarks, service marks and trade names, including STA-BIL®, TriNova®, HEET®, Start Your Engines!®, NO LEAK®, ALUMASEAL®, Gold Eagle®, DieselPower!®, Golden Touch®, 104+®, Cool Rides Online® and 303® Products used herein are trademarks or registered trademarks of Gold Eagle Co. The aforesaid families of related marks, images and symbols are the exclusive properties and trademarks of Gold Eagle Co. Any other product or company names mentioned herein are the trademarks of their respective owners.